One employee at a downtown San Francisco law firm makes coffee at the crack of dawn in rooms illuminated by lantern and refrigerator lights. A Silicon Valley firm has invested in a backup generator, and court clerks across the state keep flashlights at the ready. Everyone crosses their fingers that a blackout doesn't wipe out a petition-in-progress from the computer. Like every other business in California, lawyers are responding to the energy crisis with a combination of resignation, resolve and creativity. Just about everyone has heeded the call to dim the lights, adjust the thermostat and turn off computers when not in use. In general, there appears to be little concern about the possible effect of the state's energy woes on billable hours and in fact, some attorneys anticipate a boost in their work, particularly in bankruptcy filings. "Many of our attorneys were practicing law before computers and fax machines were regarded as indispensible," said David Brownstein, managing shareholder of Heller Ehrman White & McAuliffe's San Francisco office. "We'll continue working for our clients; if necessary, we'll work by candlelight using paper and pencil." "The operational impact (of the energy crisis) has been minimal," adds Crystal Rockwood, a spokeswoman for Pillsbury Winthrop LLP. "We are taking steps to ensure that client needs will be met regardless of blackouts and that we do not lose productivity. The effect of rolling blackouts, even if they happen every day throughout the state, should be manageable." Contrary to enduring public perceptions of exploding litigation, people are filing far fewer personal injury lawsuits in California state courts these days than they did in the late 1980s. 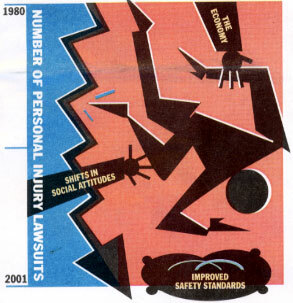 The number of personal injury suits filed last year for damages exceeding $25,000 was roughly half what it was in fiscal year 1986-1987 - the peak for the last two decades. And the data suggests that the downward slide is not isolated. Smaller civil matters and small claims cases have steadily declined in number over the last decade. And on a national level, tort and contract filings have shown a slight decrease as well. What has driven the decline, however, remains open to debate. Judges, attorneys, advocates and close observers alternately cite key court decisions, litigation-triggered safety improvements, "tort reform," alternative dispute resolution (ADR), selective filing and shifts in social attitudes as possible factors. "It's not just one thing that you can isolate," said retired Los Angeles Superior Court Judge Lawrence Waddington. "I think it's an amalgam of things." Waddington, now a resolution expert for the ADR provider JAMS, said he doesn't think anybody really knows what has caused the downward turn. But he points to Califor-nia Supreme Court decisions that have "restricted liability or restricted exposure to damages" in a variety of areas as one likely factor. Screening: One possible solution to conflicts? As the realities of modern law practice collide with traditional ethical rules and existing case law, conflicts of interest increasingly present a dilemma for some lawyers and law firms, particularly at a time when attorneys change firms and take client confidences with them. Three court rulings in the past two years have touched on the question of screening and protection of client confidentiality, but no California case has yet offered solid guidance for lawyers who move laterally and may find themselves or their new firm as an adversary to a former client. The questions surrounding "non-consensual screening," as well as four other ethical issues, will be on the table at the State Bar's Fifth Annual Ethics Symposium this month, where experts will debate lawyers' obligations in a variety of situations. A State Bar study says the surest way to stay long-standing resentment of mandatory continuing legal education is to improve its quality rather than scrap the program, which requires fewer hours of study from lawyers than similar programs for professionals such as barbers and hearing-aid dispensers. With the help of the California State Parent Teachers Association, nearly 100,000 copies of the State Bar's publication Kids and the Law - An A-to-Z Guide for Parents have been distributed throughout California. Linda Mayo, vice president of community concerns for the PTA, said the response to the guide has been overwhelming in the education community. "They are flying out of our office like crazy," she said, adding that the PTA staff has been working non-stop filling orders from schools all over the state.